In earlier decades, we feared nuclear war and communist infiltration as threats to national security. Today, computer networks in our homes, businesses and government, are key targets for infiltration, espionage, and attack. Here you can see the different ways cyberspace has become a battleground for the military, terrorists and spies. It portrays a world in which cyber-villains thrive, including the fictional Raoul Silva, from the latest Bond film, 2012's SKYFALL. The mysterious real-life hacktivist known only as Th3J35T3R (THE JESTER) shuts down websites he opposes. Once he has successfully disabled targets such as WikiLeaks or radical Islamist sites, he triumphantly tweets "TANGO DOWN." 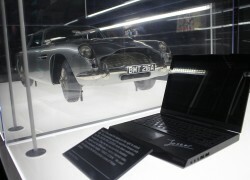 See THE JESTER's personal laptop on display in Weapons of Mass Disruption.